Leisa Naples, Lifestyle Correspondent and designer of Twins Twice Tutus gives us some sizzlin' looks at spectaculat prices. 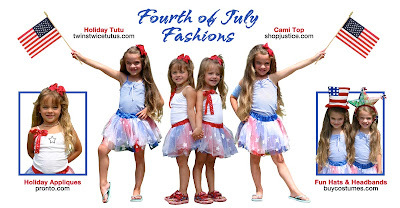 Here are some Fourth of July fashions to remember for next year! With the Fourth of July approaching, the desire to find something snazzy and patriotic is upon us. You probably won’t be looking for five inch red sequin heels like Carrie Bradshaw. Unless of course you want to be the “talk” of the family picnic. So what’s a fashionista to wear? Then to intensify the shopping experience, your children think you host the television show, What Not to Wear. They expect you to whip up a fashionable look for them also. A smart holiday shopper needs to keep in mind budget and practicality. 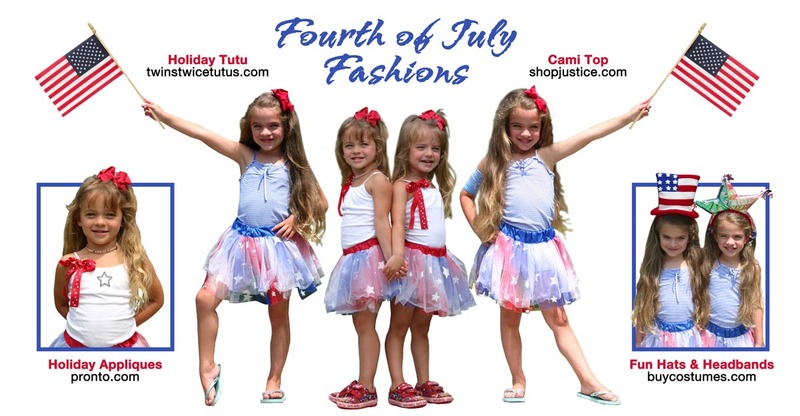 Here are the hottest finds for mom and her mini fashionistas for this Fourth of July. Justice for Girls Sublimation Studded Tee – This is a smart choice because it does not have Fourth of July graphics, so it can be worn all Summer. At only $14.94, this tee looks quite spunky with white denim shorts or a ruffled white skirt for a “girly girl” look. Justice V Neck Burnout Graphic Tee in Dazzling Blue – This beautiful blue has all the graphics that should represent the holiday. Peace and love signs decorate the front with lots of shimmer and glimmer. Ringing in at another reasonable price of $14.94. Both of these tees can be found at most Justice stores or online. The Miss America Tee at chasing-fireflies.com – If price is no object, this adorable red tee will be her favorite Summer find. What is more fun than a pool party, tofu burgers and Nana’s apple pie? This sassy red tee that is adorned with rhinestones saying Miss America across the chest. This glamorous tee is $34, but can even be worn in the Fall with a white long sleeve tee layered underneath. You can even duplicate this look for less by purchasing a plain red or blue tee and finding your own rhinestone iron on appliqué at the craft store. Cherokee Sleeveless Hanging Top – This is a favorite among all my four girls for many reasons. You can dress this cami up or down. It has an adorable ruched neckline with glitter stitching and the strap is adjustable for a perfect length. This season it comes in an adorable blue polka dot design that would be perfect for the Fourth of July. You can also go with a white cami and iron o a sequin star or flag appliqué on the front for your mini diva! At the unbelievable price of $4.99 in all Target stores, you can afford to buy one in every color. Arden B Slub Halter Top – A similar look was spotted on Audrina Patridge from the Hills on a recent episode of their Costa Rica vacation. The halter top/dress she wore was black, but if you are looking for patriotic looks this comes in red, white and blue in Arden B stores or online. The halter is reasonably priced at $29 and looks great with capri skinny jeans. Betsey Johnson Lady Bug Studs – If dressing up for this holiday is not your cup of tea, then you can show your spirit with red or blue accessories. These adorable earrings have summer written all over them and look great with Bebe’s v neck logo halter in white. The earrings are a Summer steal ringing in at only $25.